MK4-mini - the best nopass kit! * Mini - Just same with the original NDS cart size. * Support ALL NDS & Lite --- Support any version of NDS & NDS LITE. * Brightness adjust --- Can adjust the brightness level of NDS / NDS lite, keep all nds function with you. * EEPROM Save --- Build in the 2M EEPROM save chip,so can keep the nds game save through the right nds patcher. * Auto Sleep Mode --- 100% hardware support NDS power sleeping mode,you can close the nds case and open it in anytime, the game will keep to running, just same as one original NDS cart. * PLUG and PLAY --- 100% don't need modify your console,just need to plug in the MK4-mini,then can make all version of nds/nds-lite works immediately. * GBA/NDS Swap --- You can boot any flash cart (like the NEOFlash / XG / SC / M3 / EZ / MP / GBALink) form GBA slot,and you can boot MK2 / MK3 serial form NDS slot too. * R-S-A Secure --- 100% support R-S-A secure arithmetic. Build in one mode switch,you can select the GBA slot boot mode or NDS slot boot mode. How to use? 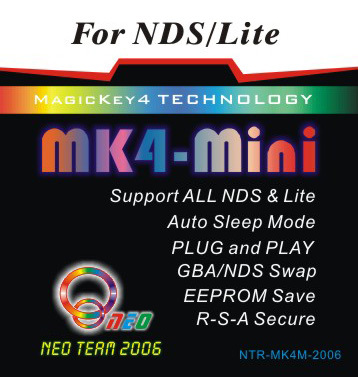 It's very easy,just plug MK4-mini to your NDS slot (any nds version are workable) and turn on your nds, that's all! If you want to use MK4-mini to boot your GBA cart,just plug the MK4-mini and GBA cart (like the NEO flash cart) into your NDS or NDS lite. Then turn the MK4-mini mode switch to "GBA MODE",turn on your console,will boot from GBA slot immediately. The looking when MK4-mini work with GBA flash cart. If you want to boot your MK2 or MK3 serial,just turn this mode switch to "NDS MODE"
NDS will auto detect the NDS cart have been inserted. Then you can see MK4 icon,just click it to enter. And insert the MK2 or MK3,press "A" to continue,you will see your NDS run the lastest version MK menu immediately! But if can't load your MK2/MK3 ,MK4-mini will auto enter the MK4-mini internal MK 0.6 menu. It can manage your SD/MMC/MK2/MK3/NEO flash cart,and can backup your NDS cart to SD/MMC too! Press button "B" --- boot from GBA slot,in this GBA mode can support some special GBA flash cart,like the GBA link. You don't need to do anything in the GBA mode,MK4 will boot your GBA cart automatical. Just turn on your NDS and enjoy it! What will come with the retail packing? Re: MK4-mini - the best nopass kit! can you play pokemon with it(diamond)?? You seem very concerned with this particular game(this isn't your first post asking about it). Remember-We support "backing up"original copies of games here,but it's O.K.to buy one,every now and again. Surely that will be supported soon,though,to answer your question. can the MK4 with neo2TF or other slot 2 solutions like m3 lite make a backup of the ds-x and or other slot 1 solutions to the SD card??? if not using the MK4 SD?? ?